The Hindi festival of lights – Diwali – is right around the corner on October 19th. The Indian diaspora is found all over the world, meaning that Diwali, and its collection of sweets called mithai, have traveled with them. You can check out our previous coverage of Diwali treats on the blog. Today, we’re celebrating Diwali Trinidad-style with Kurma. Trinidad has a long Indian heritage, so unsurprisingly, Indian treats are a big thing on the island. Kurma are ginger and cinnamon-spiced fried dough sticks in a sweet glaze, and though associated with holidays in Trinidad, they can now be found year-round. You can try your hand at Trinidadian Kurma with recipes from Simply Trini Cooking (seen below) and Trini Gourmet. When we first saw a picture of Bebinca cake from Goa, we thought it looked a little bit like Hungarian Dobos Torte. Look at all of those layers! Bebinca is a cake popular in the Western Indian region of Goa, and it is known by its 7+ distinctive layers. Bebinca is probably the most famous dessert in the region, and is even known by some as the “Queen” of Goan Desserts. Some of its fame also probably comes from its difficulty – it is as time-consuming as it is beautiful – each of the 7 layers is cooked individually and then stacked up. Despite this advanced structure, the ingredients for Bebinca are super simple: eggs, flour, coconut milk, ghee (clarified butter) and nutmeg. This dish is a product of Portuguese influence to Goa, which is definitely evident in the copious use of egg yolks – a Portuguese favorite. Here are a few recipes for Bebinca from Flavors of Mumbai and BBC Good Food. Halloween and Dia de Los Muertos are right around the corner – but so is Diwali, the Hindu festival of lights, which falls on October 30 this year. Diwali is absolutely awash with sweet treats (some of which we have covered before), collectively called Mithai, and the proper Diwali table is full with as many sweet treats as possible. One popular genre of Indian sweets is called laddoo/laddu, which are basically round truffles that come in a myriad of flavors. Today, I’m going to be sharing one of our favorite and simplest recipes for coconut laddo, which are super easy to make. Check out recipes from Veg recipes of India, Cooking and Me and Rak’s Kitchen (seen below). These laddoos also remind us of Brazilian beijinhos, one of the most popular sweets across the country. Seems like condensed milk and coconut have fans on pretty much every corner of the earth! When we lived on the North Side of Chicago one of our favorite specialty grocery stories was Patel Brothers on Devon Avenue (2610 W Devon Ave, Chicago, IL). Devon Avenue, one of the most fascinating streets in Chicago, has large concentration of Indian and Pakistani shops and businesses (and at various other stretches is also home to Jewish and Slavic communities). For the Indian and Pakistani community, Patel Brothers served as the anchor grocery store in the neighborhood. You could find anything you wanted there, from frozen ready-made foods to bulk spices to obscure grains to fresh fruit to hundreds of varieties of packaged salty snacks (yum!). When we were in Jackson Heights in Queens several years ago, we came across another Patel Brothers and we realized that it was the same chain! Now in Cleveland, we are near yet another Patel brothers. Turns out that the Patel brothers we frequented in Chicago is the original, opened in 1974, by brothers Mafat and Tulasi Patel, who immigrated from the Indian state of Gujarat in 1968. The grocery store chain has since expanded into an empire of 52 company-owned stores, and into a line of foods that is sold elsewhere, Swad. It is interesting to learn that one of the strongest footholds of Indian food in the US originated in Chicago! When we are out and about we tend to drop everything to try new foods, even if that potentially means having no idea what we are eating (actually, that is often the case). In the Supermarket the other week, we had that exact experience when M, on the spur of the moment. picked up a mustard yellow can of “Badam Drink,” a beverage that was a complete mystery. The can advertised “real bits of Badam,” and not knowing what that was, we were doubly perplexed. Thanks to some internet sleuthing, we come to find out that Badam is simply “almond” in Hindi, and this cold almond milk drink is a favorite for the hot days of Spring and Summer. Badam milk is made by soaking almonds in water or milk, blending and then adding the flavoring of saffron and cardamom. Now it wasn’t too hot in Chicago recently, but this was still quite refreshing, and would be a nice caffeine-free replacement for a chai tea latte. Diwali, the Hindu festival of lights, is right around the corner, which means it is time for Diwali sweets, or Mithai. The sweets served vary from region to region, and we have covered a few before on ETW (just a drop in the bucket), including ghugra and susiyam. However, we recently discovered a new Diwali specialty, Kaju Katli, a cashew fudge candy made with sugar and ghee (yes “Kaju” means cashew). M loves cashews, so this recipe seemed especially appropriate to try, and Kaju Katli seems pretty easy to make. Here’s a recipe from Padhu’s Kitchen and another from Rak’s Kitchen (which includes saffron). For extra flair, it is also sometimes decorated with silver leaf, vark (as below). In some ways, Kaju Katli even reminds us of one of our favorite Brazilian candies made from cashew and sugar, the cajuzinho! Indian food is certainly vegetarian, but things like ghee and paneer make it less friendly for vegans. However, Arya Bhavan is a perfect go-to restaurants for those who are vegan and want to indulge in some Indian food. We went with our cousin, a vegan as well as a big Indian food fan. The menu was quite extensive, and featured both North and South Indian favorites including a wide selection of naans, dosas, dals and paneers as well as some non-traditional salads. The menu could possibly be overwhelming, but the waitress/owner Kirti was more than happy to give recommendations. For those who really can’t decide, there is a vegan buffet on Friday nights, and throughout the weekend. Our vegan dining companion was especially excited about the vegan mango lassi, which was declared delicious. We ordered three dishes and shared among ourselves. Of course, we also selected a garlic naan, which was quite tasty. For our first dish we tried something new, Northern Indian dumplings, Malai Kofta ($12) served with a cashew gravy, which had a nice kick to it. The second dish, Dal Bunzara ($12) was composed of sauteed lentils in a cumin, green tomato and onion sauce. We also tried one of our staples, Palak Paneer ($12) with vegan cheese and spinach. Our favorite dish was actually the one most unusual to us, the Malai Kofta dumplings, which had a great texture, and we sopped up the last of the sauce with our naan. The vegan paneer was a pretty good rendition, though we’d probably stick to the dairy version elsewhere. Overall, the service was a little haphazard (ironically, they were in the process of hiring a new waitress while we were eating). However, we did not feel ignored. The waitress/owner/chef/jack-of-all-trades Chef Kirti, who waited on us was one of the most passionate owners we have ever come across, and she was fully committed to providing healthy, tasty foods for those with all sorts of dietary needs (perhaps a little too healthy…. since she warned us the barfi dessert was too fattening). It was refreshing to see someone so dedicated to her food mission! For those with even more exacting food needs there is even a raw food buffet on Monday nights, and most dishes can also be made gluten-free. There is something for everyone at Arya Bhavan, from traditional dishes to regional specialties, from dishes that are naturally veggie-only to ones that have been created specifically for vegan palates. We were happy to find a place the pleases vegans and omnivores alike! Diwali, the Hindu “festival of lights” is upon us, and that means a vast supply of excellent food. We talked a little bit about the Diwali snacks, known as Mithai, before. Mithai vary widely from region to region and it is near impossible to cover them all. This year we decided to dig a little deeper into regional specialties, like fov/poha from Goa, a rice-based dish (5 more recipes here), Ghughra, filled turnovers from Gujarat, and Susiyam, fried sweet chickpea fritters from Tamil Nadu. The recipe site Barwachi has an extensive list of regional Indian Diwali recipes, including many dishes we never have heard of before. Feijoada, a meat and bean stew of Portuguese origin, is extremely popular in Brazil, which we experienced while we were there. Everyone has a recipe, and making feijoada turns into a weekend event/party on nearly every corner. However, Brazil is not the only place that feijoada has taken hold – it also enjoys some popularity Goa, India. Goa, a region in Western India, was once a Portuguese colony (until 1961, even), which explains the heavy Portuguese influence on the local cuisine. However, feijoada from Goa is a little different in that it may include pork (rather than the typical beef in Portuuese or Brazilian versions), or is vegetarian. Goan Food Recipes has a version with pork, and My Diverse Kitchen has a recipe for vegetarian Goan feijoada. If you are not near a Diwali market, or would simply like to prepare some mithai of your own, the Guardian has a slideshow of some of the most quintessential Diwali sweets to inspire you. For those looking to make their own mithai, I Love India, SpicyTasty, Rak’s Kitchen and Divya’s Cookbook have recipes for favorites like gulab jamun, laddu, barfi and jalebi. For a non-traditional take, why not make some truffles inspired by the traditional barfi sweets. When we discovered Eggettes, a Hong Kong sweet we profiled previously, little did we know that there were similar popover confections present around the world (though we should have guessed). Ranging from India to Denmark, all of these treats are made in special pans with round indentations (as can be seen above). First up are poffertjes, mini-pancakes made with buckwheat flour that originated in the Netherlands in the 15th century. Kitchen butterfly has a recipe for poffertjes from Dutch Cooking Today (Kook ook Holland). Similar to poffertjes are ebelskivers / abelskivers / aebelskivers from Denmark, not surprising, given the proximity of the two countries. 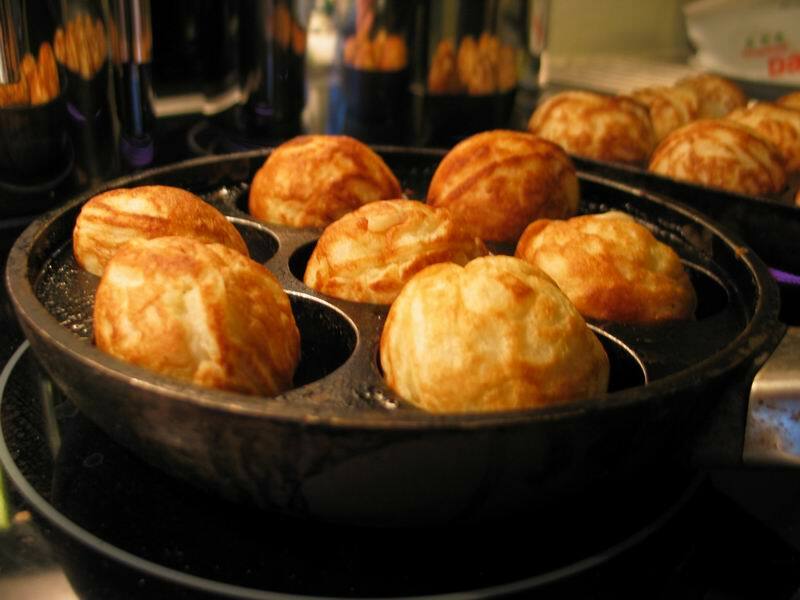 The recipes are quite similar, but an aebelskiver (or their pan, rather) is larger. For those ready to commit to the recipes: Fante’s Kitchen Shop in Philadelphia has both poffertje and aebelskiver pans, as does William-Sonoma. Also falling into this small-popover milieu are Paniyaram (seen above), an Indian snack that can be made sweet or savory. We think this serves as evidence that some things – like bite-sized carb-y snacks – are universal. 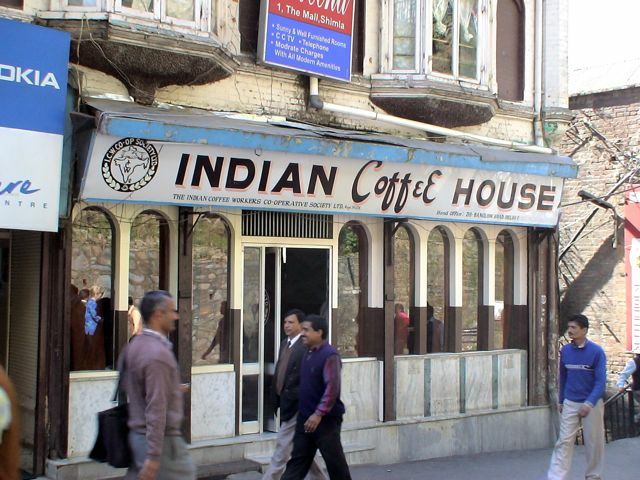 While India is famous for its storied tea culture and ubiquitous tea stands, the BBC reports that now the coffeehouse is beginning to take hold, especially for its social aspects.